Manistee Area Public Schools seeks to create secure and efficient 21st century learning facilities supportive of our mission to provide an inclusive, high-quality, diverse educational environment that inspires and fulfills the goals of all learners at every stage of their journey. A mission which includes community-wide commitment to provide a stable educational foundation, designed to support the needs of our students, families, businesses, and community for generations to come. 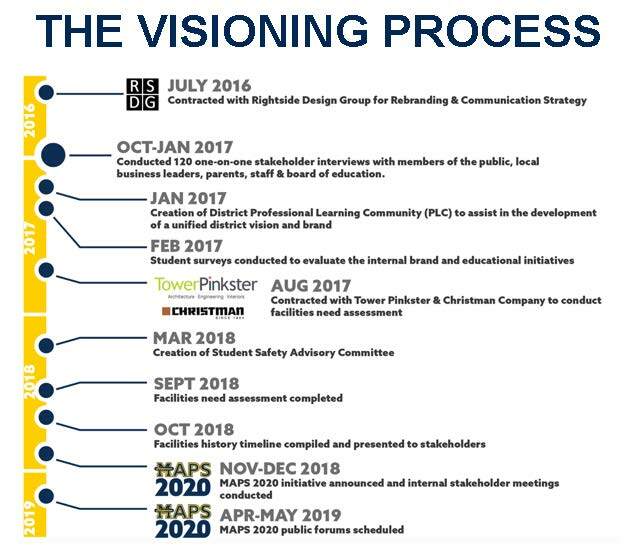 Follow each step as we outline the work that has informed of our district visioning process have your questions answered about MAPS district plan for the future. This timeline offers a review of the work that has been completed to date to inform the direction for the MAPS 2020 visioning process. In 2016, the MAPS district embarked on a project that would allow us to gain greater understanding of the community’s perspective for improving our school district district. Through this process we have learned a tremendous amount about desires and concerns of both our internal and external stakeholders and how to create a district supportive of our student’s needs. This timeline was created following the MAPS Facilities Assessment to substantiate projected financial investment that will be required over the next 20 years for existing MAPS facilities. The scope of this outline clearly demands a strategy that will reach beyond projected maintenance needs. Sources of funding, enrollment projections, useable life of assets, adapted reuse of existing space, community collaborations, and more will need to be considered when addressing a long-term solution to meet our district needs. 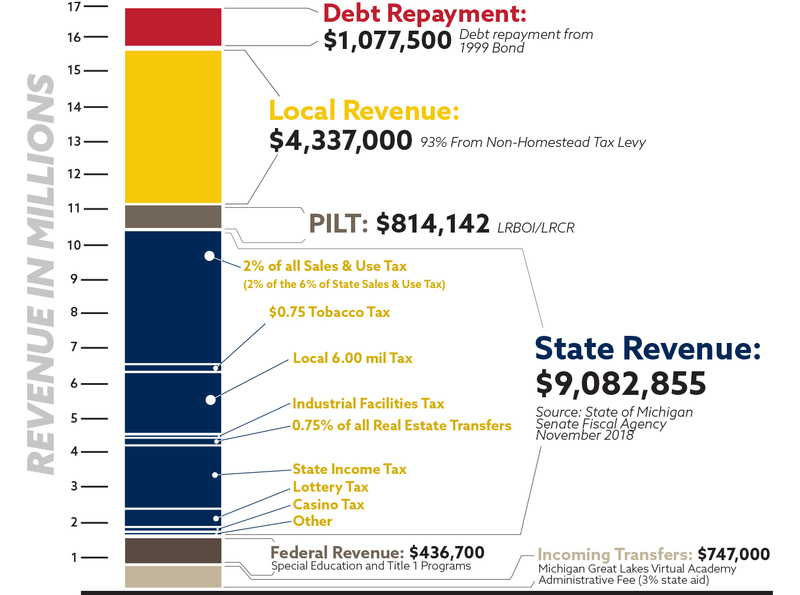 As Manistee Area Public Schools evaluates its facility and academic direction for the next 20 years, input received from stakeholders has indicated that confusion exists surrounding educational revenue sources and spending. In order to provide clarity, we have assembled information to illustrate the various educational funding sources and how dollars are spent in comparison to surrounding districts. 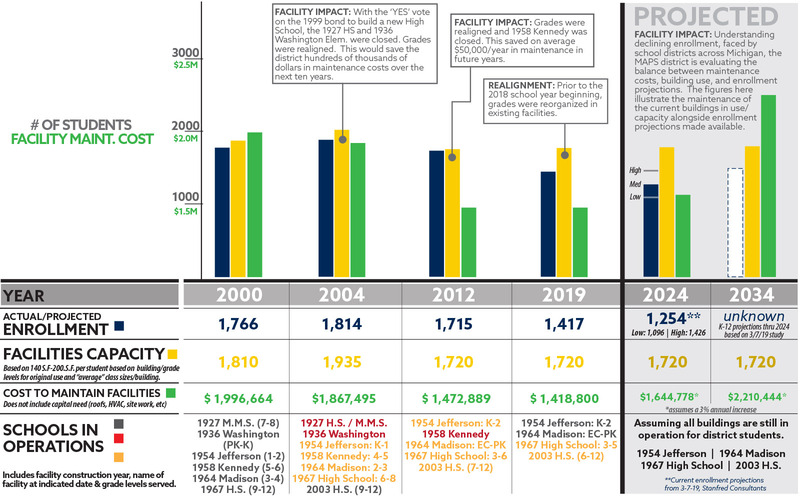 A common discussion that has come up through this process is, “how will declining enrollment impact our facilities?” This chart is designed to illustrate how our current and projected enrollment compares alongside facility capacity and costs. Have a question about MAPS 2020 visioning process or the district facilities? Perhaps you will find your answers here. If not, please don’t hesitate to submit your questions following the link below. I thought taxpayers voted to pay for the removal of the old high school, why wasn’t the building torn down? As you will see on our Facilities History timeline, the removal of the 1927 High School building was included in bond proposals in June of 1997, June of 1998, and August of 2011. All 3 of these bond proposals failed. The bond proposal that was passed in September of 1999, did not include the removal of this building. What are the long-term maintenance needs for current assets? 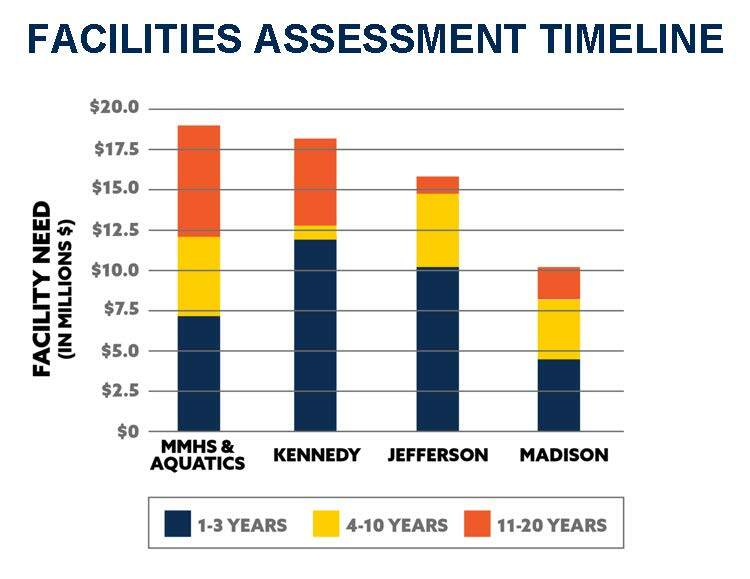 In an assessment of the district facilities of Manistee Area Public Schools, the following projections were outlined by The Christman Company regarding facilities expenditures over the next 20 years. How is the MAPS district addressing SWOT results? Recruited a dedicated Curriculum Director in 2019. Developed a professional learning community, which engages a group of educators to share expertise and works collaboratively to improve teaching skills and the academic performance of students. Continued efforts are being made in assessing student progress through work with the NWEA and incorporating data gathered into the creation of student focused solutions for optimizing instruction. Created the Student Safety Advisory Committee (SSAC) a community-based safety initiative team to research, devise, and inform the Board of Education regarding initiatives to improve safety. Identified, applied for, and was awarded grant dollars to improve safety features of district assets. Additional opportunities are being continually sought. Leading student group initiatives focused on improved internal culture and positive decision making. Ongoing participation of administration, staff, and students in local efforts and training for safety awareness initiatives. Implemented outreach effort with internal and external stakeholders to better understand the perception, concerns, and desires of our community. Assembled a staff leadership committee to lead internal culture development and proliferation. Launched a new website focused on improvement of communication and robust and easily accessible resources. Engaging in discussion with internal and external stakeholders to identify a 20-year vision for district facilities plan. Identifying potential bond initiative to fund highest priority facilities needs. Outlining 20-year strategy for maintaining existing district assets. 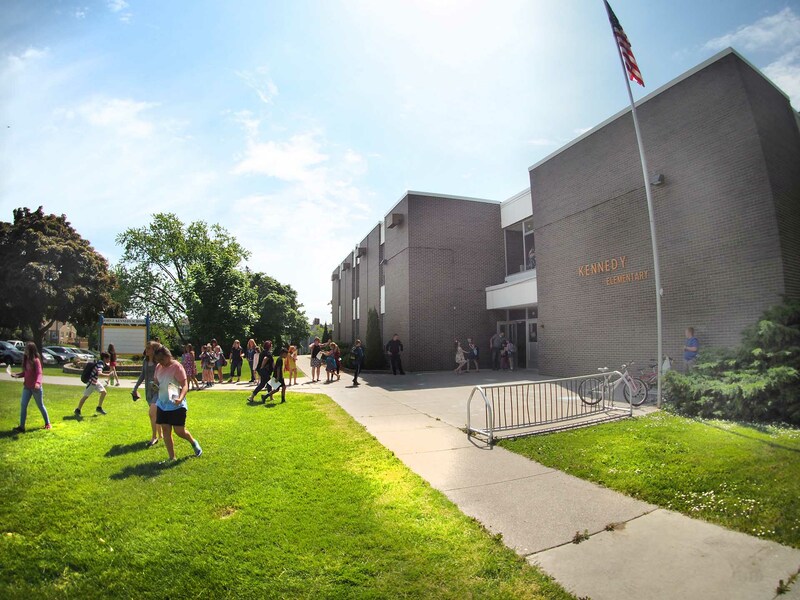 Maintaining the integrity of the operating budget while making infrastructure improvements for creatingsafe, secure, healthy and energy-efficient school in partnership with Honeywell Initiatives. Where can I learn more about MAPS budget and financial plan? How did Proposal A change state school funding? Prior to Proposal A, schools were financed primarily through local property taxes. In 1993-94, Michigan home and business owners were paying on average 33 operational mills assessed on the State Equalized Value (50% of market value) of their properties. At that time, local taxation accounted for roughly 69% of the State/local split of school finance, with State funding making up the other 31%. In July of 1993, the Michigan Legislature approved, and the Governor signed into law, P.A. 145 of 1993. This law exempted all real and personal property taxes for school operating purposes beginning in 1994. This law eliminated approximately 64% or $6.4 billion of $10.0 billion of total K-12 school funding beginning in FY 1994-95, requiring the Legislature to create a new funding structure. I don't have a student in the school district, why should I be concerned about schools? According to the National Bureau of Economic Research, there is a clear connection between school expenditures and home values. A report titled, “Using Market Valuation to Assess Public School Spending,” found that for every dollar spent on public schools in a community, home values increased by $20. These findings indicate that additional school expenditures may benefit everyone in the community, whether or not those residents actually have children in the local public-school system. In a 2009 study at Georgia Tech, the effects of the recession on housing values were studied to identify changes in the demand for certain characteristics of residential properties as the market was falling. They analyzed home buying influencing characteristics such as bedrooms, bathrooms, square footage, age, stories, garage, basement, general interior and exterior, school district, crime stats, median income, etc. The research discovered that a quality school district can have a profound insulating effect on the housing values in the surrounding community. How can our school district impact the Economic Development initiative happening in Manistee? In 2011, Michael Walden is an economist at North Carolina State University, wrote an extensive report on the economic impact of public schools. He indicates one of the most important impacts of a school district on its local economy is from the “outputs” of schools such as the generation of successful graduates who will be more productive in the local economy and who impose fewer public costs by becoming less likely to engage in crime and drug use, and more likely to lead healthier, productive lifestyles. Local Manistee community entities are working in collaboration with the Michigan Economic Development Corporation through the Rising Tide Initiative to identify how to improve the economic forecast of Manistee County by measuring which efforts will have the greatest long-term impact on economic concerns such as job stability, workforce development, and affordable housing. Manistee Area Public Schools works to ensure an educational foundation that is supportive of these efforts. How has School of Choice impacted the school district? According to a National Bureau of Economic Research report, it was found that the degree of external competition that a school district faces from neighboring districts may also affect the efficiency of school spending and therefore housing values. This speaks to a more expansive concern to school districts and their surrounding communities regarding student retention in the face of the School of Choice option. With the introduction of School of Choice in 1996, school districts were placed in the position of having to consider marketability for the first time. Over the last 5 years, MAPS SOC population is showing an upward trend in SOC transfers with a loss of an average of 200 students each year, and in coming transfers averaging at approximately 173 students. Proving a margin exists for improvement. In a competitive market, it becomes critical for school districts to identify what impacts decision making. Parents are measuring 21stCentury learning amenities, test scores, academic offerings, extracurricular diversity, fiscal responsibility, social and behavioral supports, community pride, and more.